Discussion in 'Downhill & Freeride' started by mtg, Jun 20, 2012. As some people have already seen, I posted a couple pics in the 2012 Rides thread of a prototype DH bike made by Guerrilla Gravity. We want to get the word out there about what weve done so far and where were headed. I think the monkeys will be stoked on it. 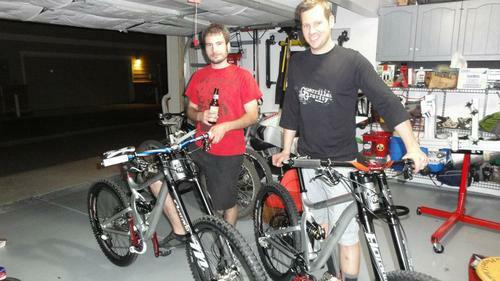 We are a new rider-direct mountain bike frame manufacturing company. 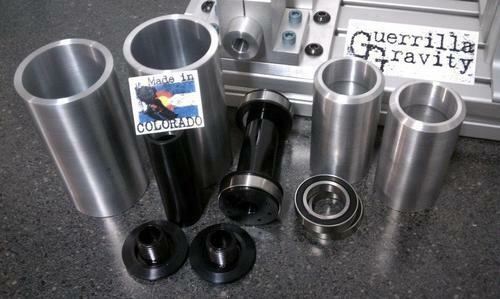 We build our frames right here in Denver, Colorado. Our focus is on the gravity-influenced side of mountain biking--park riding, downhilling, dirt jumping, the fun part of trail riding. Our first bike is the GG/DH. We finished the first two Alpha prototypes at the beginning of May. The rider-direct model puts us one step closer to the riders. It also allows us to compete with the Asian-manufactured alternatives. Local manufacturing gives us complete control over the process from start to finish, as well as providing faster time to market. 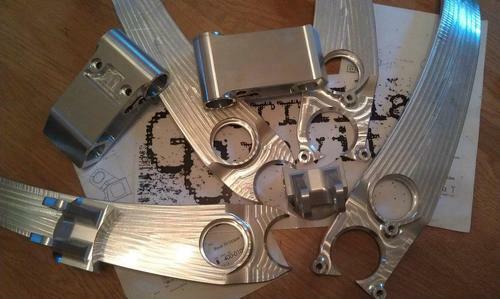 Additionally, unlike any other manufacturer, we have the GG Rider Program. 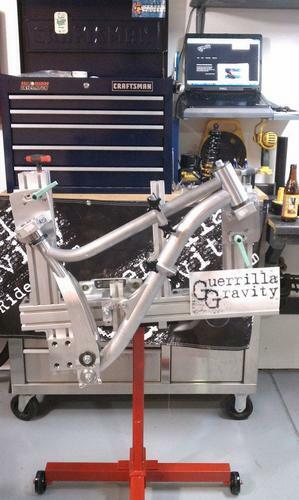 Anybody that buys a Guerrilla Gravity bike is automatically in the program. The program includes race support, referral credits, and nets 10% off products and services with many partner companies. We already have a list of partners signed up, which covers the range from tires, components, suspension service, physical therapists, and even the best hot dog stand ever, etc. The GG/DH is the downhill workhorse, designed for the everyday rider looking for a refined design without any unnecessary complication. It's a bike for the rider that wants something that's high performance, yet easy to maintain. The geometry is low, slack, and adjustable. The suspension is progressive and the frame laterally stiff. The ride is lively, making it easy to snap around and pop over the gnar. Guerrilla Gravity is a three person venture at the moment, with Will being the business/branding/strategy leader, Kristy preparing the sales side of the business, and I am the engineer (Matt). All of us are avid riders and racers, which is of course crucial to developing something that works well. My experience has included designing and fabricating racecar frames & suspension systems, with additional industry experience in aerospace and industrial product manufacturing as a Sr Mechanical Design Engineer. The Betas. We are making a handful of small tweaks to the design, but the overall geometry and ride characteristics of the bike will remain unchanged. For the next batch, 15 pre-production Beta frames will be available to the public. We will look to the Beta Riders to provide us with valuable feedback as we move into production. 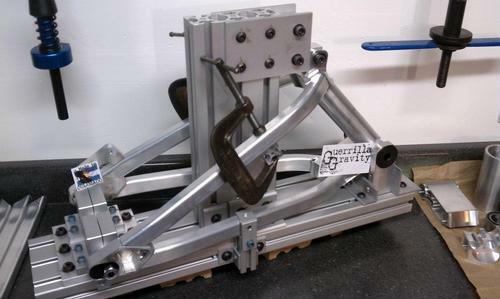 Included in the development of the next batch is continued ride testing, more behind the scenes engineering and testing, in addition to the design refinements. More info will be available soon on this front. My signature is a link to our facebook page, which is updated often, and has moar info, such as geometry. See ya in Shed Town! "even the best hot dog stand ever"
Brian's Dogs? If so sign me up! Look forward to seeing them on the mountains. Looks nice. Being a short rider, I'd love to see a photo of how something sized as a "Small" would look with that design. I'll be keeping a watch for what you come up with for the fun side of trail riding as well. Wow, I've learned about two new startups in the past couple of weeks, this is awesome! Hats off to you for keeping everything local. I love your frame design as well. Some may disagree but single pivot with a linear rising rate curve like you've designed is all anyone will ever need and will get the most out of the awesome shocks we have these days. Simple, durable, predictable! If I wasn't happy with my current rig I would definitely be considering one your betas. I wish you guys lots of success! Hot dog stand: hell yeah it's Brian's Dogs. For those that don't know, if you ever find yourself in Idaho Springs, CO, stop by Brian's Dogs. It's real great. Sizing: both Alpha frames use the Long front triangle. The Short front triangle is part of the Beta program, and I'll be designing it very soon. Thanks for the compliments, and keep the questions coming. Standover was mainly what I wanted to see with the design. I'm 5'5"
Standover: understandable. We have several girls that are 5'4" to 5'6" on the Beta list, and they all thought the Standover on the Alphas was fine. So, it'll be the same on the Betas, but that will be something we pay attention to when shorter people ride them. Off the top of my head, I think it is about 28", but I'll measure it again. I saw one or two of your bikes up at Trestle over the weekend and checked them out while in line. Without riding I'll reserve any real opinion, but I will say nice job so far and best of luck. Some may disagree but single pivot with a linear rising rate curve like you've designed is all anyone will ever need and will get the most out of the awesome shocks we have these days. Simple, durable, predictable! If I wasn't happy with my current rig I would definitely be considering one your betas. I wish you guys lots of success! Good looking bike! Keeping the manufacturing local is awesome, and the bike looks fantastic. Keep up the good work! true, but I wish the pivot was a little higher, just a little above the top of the chainring. Otherwise I really like the idea. Do people (non Pros) really notice small changes like that? I know I'm a bit of a hack but I can't imagine bombing down a trail and thinking to myself "Man I wish my pivot was 5mm higher." Do people (non Pros) really notice small changes like that? " I could tell the difference between a DHR and Brooklyn pretty easily, same with a Trek Fuel vs. Voodoo Canzo. That's a pretty dramatic difference between each, but I don't think it's unrealistic to notice a change. Pedaling improves dramatically when your pivot is in the right spot, and suspension performance can as well. Ever notice how people talk about the zerode, how it eats bumps? It's because of the pivot location. It's hard to tell from these photos, but I was seeing a change in pivot height of an inch or two, and changing the frame from pro-squat to anti squat, if my DWisms are correct. Bikes such as these (single pivot with a rising rate) are fun dh bikes in the aspect that 1. they are as simple as it gets. 2. the suspension actuation is extremely predictable and supple, makes it fun to just point it and ride, use your body with the bike to pump and soak up what ever is needed, its a much more involved ride then compared to something that just munches everything up. A playful bike is a playful bike, and fun is fun, that is why we ride isn't it? About the pivot location, yes, it matters, and we put a lot of scrutiny into the location we used. Whether or not the everyday rider can feel the difference in square edge performance by moving the pivot 5mm is a good question. However, the everyday rider can tell the difference between 20% and 100% anti squat while pedaling, which was a factor in our pivot location. If you make the pivot super high, it helps smooth the ride in very rough sections, but then you either have to add an idler, or deal with excessive chain growth and inefficient pedaling. We chose a spot which produces a good balance between axle path for square edge hits, doesn't suffer from excessive chain growth, doesn't require an idler, and has around 100% anti squat in most scenarios that normal humans (ie, not Minnaar) will put down the most power through the pedals. I think most people would consider it a mid-high pivot. We have been letting people test ride the Alphas, so anybody that is curious, let me know and we'll figure out a demo if you're around Colorado. Tetreault, you pretty much nailed it. That absolutely describes the GG/DH. Rad. 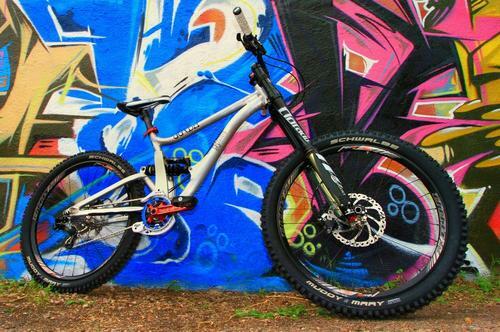 This bike will be on my short list when I go for a new DH bike. I like the pivot location. It's the reason a DHR is so fun. The rear end shortens and rails turns vs those stupid high pivots. Yeah for USA made bikes. For you..... Obviously, from their web site. Downtube must have you fooled. I'm liking the High setting. But, that's just me. Progressive Leverage Curve - No Blowing Through the Travel or Harsh Top Stroke Here! Head Angle, Low: 63.5 deg. Head Angle, High: 64.2 deg. Yep, above is the geometry. There is a caveat, though. 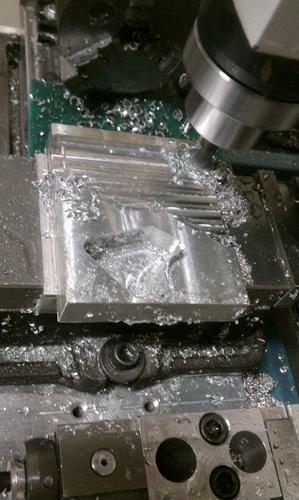 Those numbers are for a 571mm axle to crown height, 45mm offset, and a shock that is 9.500" eye to eye. 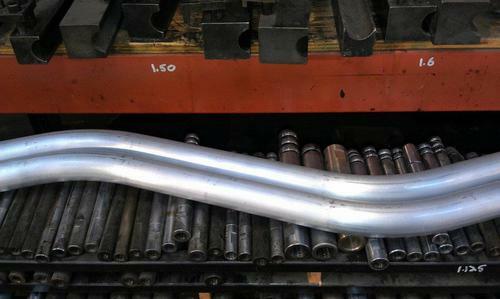 Both prototypes have Dorado forks at 590mm axle to crown, 49.5mm offset and mine has a CCDB shock, which is 240mm (almost 2mm shorter than 9.5"). My angle finder claims that I'm running mine about 1/2 to 1 degree more slack than the geometry numbers above. BB height is about 1/8" lower than above. Additional note: my rear tire is a 2.35, front is a 2.5. About the geometry adjust, a good number of bikes have that feature, but they are usually too tall/steep in the high setting, and people seem to always leave them in the low/slack setting and never adjust it. We didn't want that to happen, so we made both settings useful. It definitely feels real low, long & slack in the low setting, but the high setting still works well also- I raced mine in the low setting at Angel Fire, but it felt better in the high setting at Trestle bike park. It doesn't matter what people may or may not notice. It does matter what will make them faster and more confident. Every bike is a compromise, pick the best compromise for you. These GGs I'd imagine will feel fast on and smash smoother fun tracks with burms and jumps. I'd imagine they'll feel very natural and predictable. Would like to see a 6" park version, I think the design will really shine there. Is the pivot above or below a 38 tooth chain ring chaiine? Great to see another brand start up, good luck fellas. Enough already. No one cares. 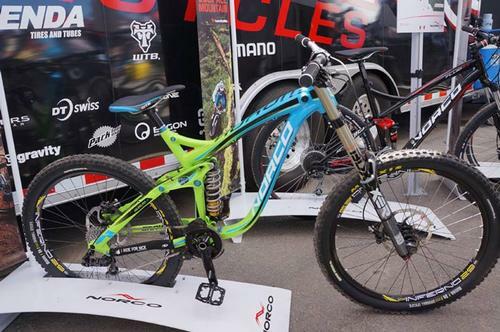 It is also reminiscent a bit of FTW's latest DH bike, though the geometry looks raked out a bit. Don't take this as a slight, I think that it's awesome to see more solid single pivots out there! EDIT: Now that I've taken a closer look, I see the differences in my quick comparison. You all have a bit of a lower pivot than the FTW FB-10. After seeing a couple one off bikes this weekend, I am happy and excited for the little guy. Chris from Suspension Experts' Canfield was cool as heck sounding going by...like a muffin getting punched by a marshmallow. And Rob DeMao's Zerode was neat looking too. DH bikes have finally gotten to the point where you can ride the snot out of most any of them without failure. Used to, all you ever saw was riders in the lot working on bikes. Now, if you have 180 riders, there are 5 guys in the pits drinking beers pointing at 1 guys bent brake lever and 174 riders on the mountain. Good luck. Find a good painter. Raw, Raw, and Raw alu FTW! What about a feature that riders definitely will notice - the price? Beta price: 1850 for frame & shock. We also have a frameset+ option that adds fork, headset, post, collar, as well as two complete builds. Final details on that stuff will be posted soon. Not a bad price at all.